› Author AffiliationsM.G.U. thanks the Ministry of Education and Science of the Russian Federation (Project No. 4.5371.2017/8.9) and Russian Foundation for Basic Research (grant No. 16-03-00513 А). V.T.A. thanks Russian Foundation for Basic Research (grant No. 16-03-00807 А). 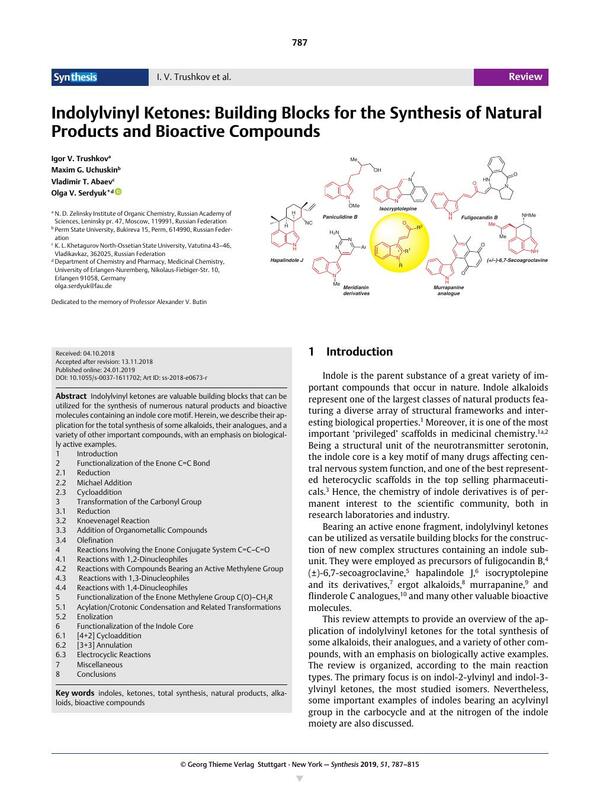 Indolylvinyl ketones are valuable building blocks that can be utilized for the synthesis of numerous natural products and bioactive molecules containing an indole core motif. Herein, we describe their application for the total synthesis of some alkaloids, their analogues, and a variety of other important compounds, with an emphasis on biologically active examples.